Danny Dyer is perhaps England’s most beloved cockney geezer. With a career spanning almost 25 years in television, theatre, and film, Dyer has become somewhat of a British institution, instantly recognisable through his straight talking manner and East End swagger. Who is Danny Dyer, how old is he, when is his birthday, how tall is he and what is his background? Born in Canning Town, East London on July 24, 1977, Danny Dyer is a 41-year-old actor and TV personality. He stands at 1.83 metres tall. Why is Danny Dyer famous and what is his occupation? Danny is a well-known British actor. His career began when he was spotted at his local Sunday acting school by an agent, who subsequently landed him the role of Martin Fletcher in Prime Suspect 3. Since then, Dyer has appeared in a wide variety of films and TV shows, as well as several plays directed by the 2005 Nobel Laureate, Harold Pinter, with whom he struck up an unlikely friendship. He has also presented his own documentary series, Danny Dyer’s Deadliest Men, in which he offered insight into the lives of some of Britain’s most frightening and feared gangsters, hardmen, and ex-convicts. He is perhaps now best known for playing Mick Carter in EastEnders, the landlord of the iconic Queen Victoria pub. Danny has confessed to hiding his acting ambitions from his friends as a teenager after receiving homophobic abuse, despite not being gay, after they learned that he had been to acting classes. What is Danny Dyer’s net worth? Danny Dyer has an estimated net worth of £500,000. 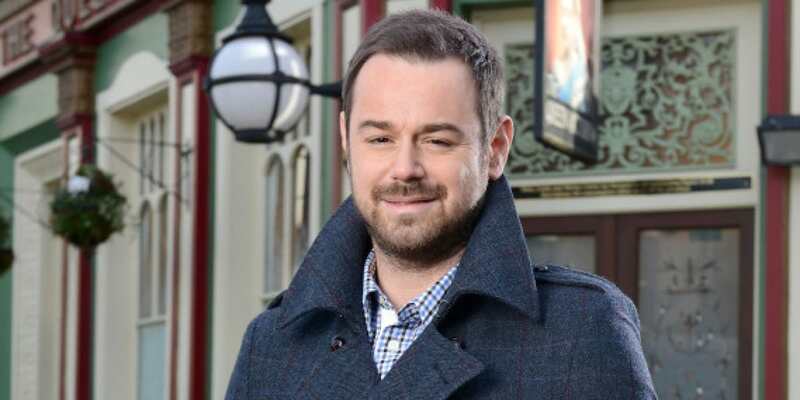 Currently the highest earning star in EastEnders, Danny Dyer is estimated to rake in £400,000 a year. Where does Danny Dyer live? The actor owns a £1.5 million house in Debden, Essex, though he has recently been spotted at a North London residence. Who is Danny Dyer dating, who has he dated in the past and why did they break up? Dyer married long term partner, Joanne Mas, on Saturday 3 September 2016. However, the couple had reportedly been on a break since news broke of an alleged affair between Dyer and ex-Girls Aloud member Sarah Harding back in 2012 while they were filming for Run for Your Wife, a rumour that intensified with news of his residence in North London. However the couple are now said to be back on track. 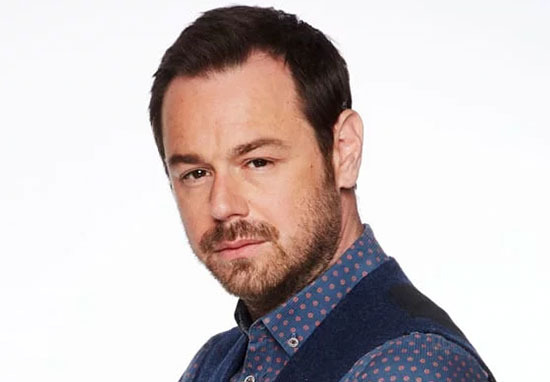 Why is Danny Dyer leaving EastEnders, how long was he on it for, who was his character, when did he join? He waltzed into Walford in 2013 and has enjoyed plenty of plaudits for his performance as the Queen Vic’s landlord, Mick Carter. However, Dyer was forced to take a break from the soap in February 2017 to help him deal with personal issues, mood swings, and a recurrent alcohol problem. Although he has since returned, there is still some doubt as to whether he will sign a new contract when his current deal runs out. What TV shows has Danny Dyer been on? The British star made his name, and defined his trademark laddish role, in football films, such as Mean Machine and The Football Factory, as well as gangster films, such as The Business. However, he has also appeared in several high profile British TV shows, in cameos and longer term roles, including A Touch of Frost, The Bill, Foyle’s War, Hotel Babylon, Skins, Casualty, and Hollyoaks Later. Danny was the subject of an episode of the popular BBC ancestral show Who Do You Think You Are? in 2016. He was baffled to discover during the course of the show that his 14th great grandmother was Elizabeth Seymour, the sister of Jane Seymour, who was the third of King Henry VIII’s six wives. The Seymour family descended from Edward III, the King of England during the early fourteenth century, making Danny Dyer a direct descendant of royalty. What is Danny Dyer’s real name? Danny is simply an abbreviation of his full name, Daniel. However, there was briefly some confusion as to whether this was a pseudonym after Keith Lemon joked on his comedy panel show, Celebrity Juice, that his real name was Malcolm Smith. Which football team does Danny Dyer support? Dyer is a lifelong West Ham United fan. Has Danny Dyer won any awards and what are they? Since working on EastEnders, Danny has been nominated for Best Actor three times and Best On-Screen Partnership twice at the British Soap Awards, as well as being nominated for Sexiest Male in 2015. He also received two National Television Awards for Most Popular Serial Drama Performance while being part of the cast of EastEnders, in 2015 and 2016.